In the teams' last meeting on Nov. 23, Miami overcame a 16-point deficit in the second half to defeat Orlando, 101-99, for its seventh straight victory in the series. 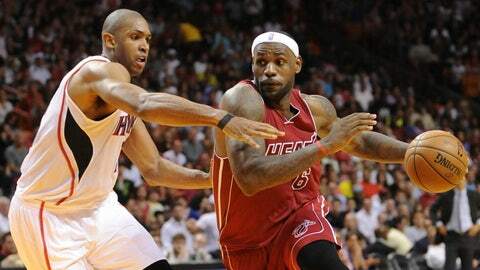 Rarely do the Miami Heat have trouble keeping up with an opponent, but that was the case their last time out. Given the way things have been going lately for Orlando’s offense, the Heat should be able to bounce back when they visit the Magic on Saturday night. Miami (24-8) is typically the team pushing the tempo and forcing the opposition to try and play catch-up, but Thursday against Golden State the Heat were overwhelmed in a 123-114 loss. The Warriors made 15 of 29 shots from beyond the arc with Stephen Curry hitting eight to finish with 36 points. Golden State shot 56.1 percent overall as Miami allowed its most points at home in a non-overtime game since LeBron James, Dwyane Wade and Chris Bosh became teammates in 2010-11. Miami's LeBron James collected his 11th player of the month award as a member of the Heat, after averaging 24.6 points in December. "You have to have the mental toughness to stay the course," coach Erik Spoelstra said. "But also (have) the mental toughness to go down to the other end and forget about what just happened and focus on what we need to do offensively. We could have done a better job of that." Despite Spoelstra’s criticism, the Heat still played well offensively, shooting 51.3 percent to lose for only the second time in 20 games when hitting at least 50 percent of their shots. They also reached triple digits in scoring for the sixth time in seven contests, averaging 109.4 points over that stretch. Coming close to those numbers against Orlando would likely mean a victory. The Magic (10-22) have scored 81 in each of their last two games on 38.2 percent shooting. They did score 109 in each of their previous two games but those wins came over defensively challenged Detroit and an Atlanta team playing the second game of a back-to-back without Al Horford. In Thursday’s 87-81 overtime loss at Cleveland, Orlando was on the verge of victory, leading by 10 with 1:21 remaining before completely collapsing. The Magic totaled two more points on 1-of-8 shooting over the rest of regulation and overtime. "We blew it, bottom line," Orlando forward Tobias Harris said. "It was a tough, tough loss. The whole game, we thought it was ours. These are the ones we need to win. Very tough loss." 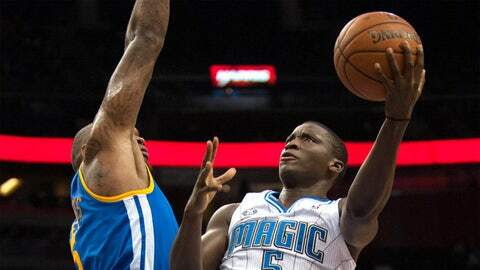 Victor Oladipo became the first Orlando Magic player in more than a decade to capture Rookie of the Month honors. The Magic also seemed to be on the way to victory in their last game against Miami on Nov. 23, up by as much as 16 in the second half, but ended up suffering a 101-99 road loss — their seventh straight defeat in the series. Three days earlier in Orlando, the Heat cruised to a 120-92 victory. Wade had a game-high 27 points on 9-of-16 shooting in the last matchup after missing the season’s first meeting to rest his knees. 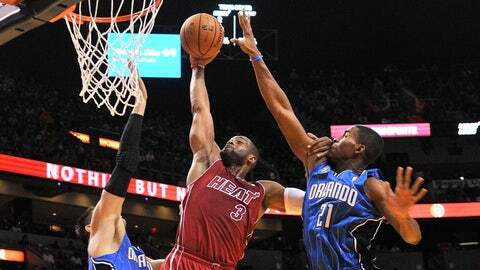 In 33 career games versus Orlando, Wade is averaging 28.1 points, his highest mark against any team. He had 22 points on 9-of-18 shooting against the Warriors, while James scored 26 and shot 10 of 16. James has shot 50 percent or better in each of his last nine games, averaging 26.6 points on 60.7 percent from the field. Much has been made of the Heat’s struggles on the glass — their average of 36.1 rebounds per game is worst in the NBA — but they could catch a break against the Magic. Orlando center Nikola Vucevic, who is averaging 13.4 points and a team-high 11.1 rebounds, sat out Thursday with a sprained left ankle. He is considered day to day, but the Magic will use caution after he missed four games with the same injury in early December.